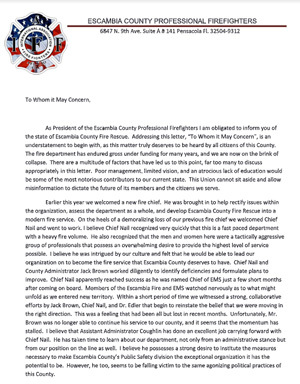 Thursday, the president of the Escambia County Professional Firefighters union told the Escambia County Commission that there are Escambia County Fire Rescue funding issues that need to be addressed. “What are we going to do about the financial problems of the fire department? How are we going to maintain funding and stop eating ourselves from within and continue to grow? We are we going to do to empower the fire chief that we brought in from outside the area to fix this place, so to speak, and help us grow and become the department of the 21st century that we’ve all boasted that we want it to be,” Nick Gradia asked commissioners during a public forum meeting. Gradia said he sent letter to each commissioner about two week ago outlining the problems, but he says the commission has not responded. He said there is a definite problem with firefighter recruitment and retention due to pay constraints. Due to ongoing collective bargaining talks between the firefighters and the county, commissioners were limited in the responses they could provide to Gradia in reference to salaries. Commissioners held an executive session Thursday morning to discuss firefighter pay. Alison Rogers, county attorney, reminded commissioners during Thursday’s public forum meeting that were not allowed to negotiate in any manner outside the bargaining process. “Speaking for myself, we are very concerned about all of our public safety employees, and so those issues will be addressed,” BOCC Chairman Lumon May said. “I brought 30 guys here today,” Gradia said. “These folks are worried about their jobs. They are worried about their futures. 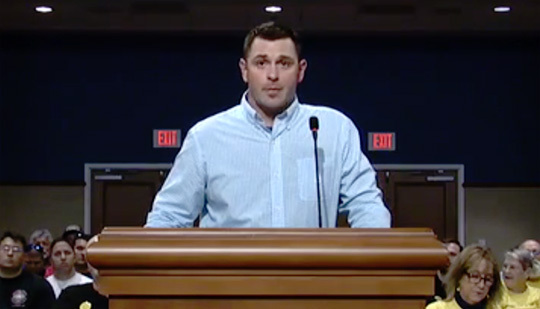 Pictured: Escambia County Professional Firefighters President Nick Gradia addresses the Escambia County Commission during a public forum Thursday with about 30 firefighters in the audience. Photos for NorthEscambia.com, click to enlarge. Want a solution? City and County consolidation. It has worked in Louisville, KY and Indianapolis was a dying city until they consolidated and started booming economically again. I don’t get why so many people are against consolidation, but maybe they just cannot think for themselves. Perhaps the FF union could tell us what exactly county fire needs more funds for, besides salaries and health care. I read the question about “what are we going to do about the financial problems of the FD.” Perhaps you could be more specific. Phil..why should it be illegal? Public employees need a union because individual employees are not allowed to negotiate pay, benefits or employee protections. Any group of workers would be served well to have representation. What Escambia County needs, like other well run counties in Florida is an impact fee on new construction. Then perhaps the county could use existing funds more wisely. Are busses all over for low ridership and even WI-FI nessarly? Just off of the top of the list? I will bet there many more waste that can be cut. Nick has hit the nail on the head. There’s a real issues in regard to how the fire department is funded in that it does not have a revenue source increasing over time. What this means is that it’s hard to accommodate any pay increase or increases in cost for health insurance or other operating costs unless additional households are built within the community the revenues are limited. Most communities are defined by how well they do three things: prevent crime; maintain infrastructure; and provide safe environment in the area of fire and EMS protection. It appears Escambia county is addressing part of the issue with the additional funds that have been allocated to the Sheriff’s Department to provide relief from pay compression. The fire department encounters the same pressures. They have limited rank promotion opportunities and very little incentive to expand their skills in various forms of fire Sciences. There’s a variety of things that could be done at the bargaining table but without funding it can’t be accomplished. It looks to me as though the commission is faced with protecting its citizens or trying to maintain a tax posture that has dire ramifications long-term for the county. Anyone who complains about paying firefighters should be able to sign a do not respond list. Maybe it’s time for your husband to look for higher paying job I’m sure he knew what the pay was when he applied for job. The deputies/firemen are all under paid and many others also. It would be nice if we all had jobs that paid us enough to live on but that’s life. The problem with working for city/county when your salary is paid by the taxes people have to pay. As a Law Enforcement Officer in this county, I wish the Fire Fighters the best of luck getting anything from this county. You guys/gals deserve a pay raise because just like us, regardless of the time or location, someone dials 9-1-1 in need of your service and you’re there. I’ve worked many nights and value both our Fire Fighters, EMT’s and Paramedics and all first responders in this county are underappreciated. Our BOCC will never understand the value, it appears their priorities are usually backward. They will throw $20 million dollars into a traffic circle though. Concerned: you have no idea how this works and until you do please refrain from making ignorant comments. union dues have nothing to do with what is going on. career FF’s came on board due to the inability of the volunteers to keep consistent numbers and respond in a timely fashion. Let’s say that career ff’s are thrown out and replaced, how long will it take for all the ff’s that now volunteer are up to par on the proper, yes proper, training to mitigate all the incidents that they will respond to? do you even know what type of calls the fd responds to? I await your response. Straightshooter: Sheriff Morgan is an elected official. he can jump up and down and pitch a fit with little to no repercussions. if the fire chief does that they will ask for his resignation or fire him on the spot. you see, the fd is more essential than you may think. they respond to a diverse number of calls, over 16000 last year alone. they range from helping an elderly person off the floor in the wee hrs of the a.m., cardiac arrests, crashes, fires of course, an array of medical calls, hazmat calls, elevator entrapment calls and the list goes on. lastly, “don’t like the pay, don’t apply there” laughable point. some grow up wanting to be ff’s and applying at an fd is not like applying at a fast food joint or grocery store and they have aspirations of doing good their community and serving them in their time of need. - Are you sure you want to explore career personnel in your district Mr. Bergosh? You have made some comments that could be taken as negative about career personnel. This has been an ongoing problem for years. The BOCC gets a little heat and they bang the gavel and funding appears yet with no plan for the future. This cannot be handled on an “as needed basis”, it must be planned on for at least 5 years in the future. Navy Fed has multi-million dollar buildings in your district and you want to turn OLF 8 into a “small town”. You must consider the needs of the future not only for public safety but infrastructure as well but that’s another blog. Do you think these multi-million dollar companies are going to give Escambia Co. a second look if their insurance rates will be effected or their buildings are protected by a FD that is lacking? Have you explained to property owner’s how a FD effects their insurance rates. Volunteer (actually “paid” w/ stipend) versus a career fully staffed around the clock fire station? Do they know the benefits of a hydrant near their property(ies)? Do they know the FD can provide ALS care (like an ambulance but unable to transport) Do they understand what that can do for their quality of life? Do they know the capabilities of the FD as far as special rescue, hazmat, water rescue, etc that their FD provides? Do they know their FD has been working to improve their ISO rating for the citizens? Education is key. The property owners deserve to know. The citizens deserve to know. The FD can do a better job of “marketing” but they are busy training and saving lives and property. Speaking of lives, did you know that the FD pulled three Escambia citizens out of burning homes as recently as the last 6 mos. 2 survived and one succumbed to his injuries that were incurred prior to FD arrival. All Departments have frozen positions that cant be filled , the same pay and retention issues and equipment that needed replacement years ago. Go back to all Volunteer Fire Firefighters, they don’t pay Union Dues! We use to have Florida Civil Services but all County Entities voted them out and wanted to handle departments on their own and it has not worked as they wanted. The ones at the top of the Triangle are better off, but not the ones at the bottom. Raising taxes for the ones owning property is not the way because most are on a fixed income and those checks don’t go up and they might make anywhere from $1000.000 to $2000.00 a month. If Union is not happy go somewhere else to work!! The fire trucks have gotten better about not riding up and down the road since the new tracking system has been put in place. Now everyone wants to use county gas to go eat when each station is equipped with a kitchen and food can be carried from home and prepared that would cut their cost down and ours as citizens. The MSBU fire fee was increased a couple years ago. It was done to increase staffing levels, place paid firemen in 5 additional stations throughout the County. That increase and the ones before are the root of the problem. It’s not that the department is mismanaging money, or living outside it’s means. As operating costs have risen over the years, no increase was accounted for or provided. Look at it this way, the tax increase imposed a couple years ago was levied based on what the cost compared at 10 years ago. There’s no way for us to keep up. The pay is another issue all together. None of the firemen do it to get rich, and I don’t think it’s unreasonable to ask for competitive pay within your field of work. We’re more concerned that the administration properly fund the department, then rest will take care of itself. My husband is an Escambia County firefighter. He makes just over $11 an hour. This is not enough money to support a family! Our fire department does not just respond to fires. They respond to car accidents, medical emergencies, water rescues, biohazard calls, structural collapse. These men and their families deserve more! Lou, If I remember correctly, it started at $5:00 per household and $25:00 for businesses. Fire Union is taking a play out of Sherriff Morgan’s playbook. Public workers are needed but like teachers, you know what the job pays when you apply. Don’t like the pay, don’t apply there. Welcome to living, working and surviving in NW Florida. For what ever reason our area’s pay is and has always been behind. When our fire assessment fee started, it was $25 and that has steadily increased, with no cap. All our public servant jobs are all important, not one more than the other, and are all underpaid. Didn’t they just increase our property taxes in order to increase funding for firefighters? I’m not opposed to the Fire Departments getting the funding they need but we need to see some numbers and have a lot of discussion before we go there again.